Acne is your body’s way of telling you it is out of balance. It won't go away until you correct the imbalances causing it in the first place. Perhaps this a blessing in disguise?! What I mean by that is your body is providing you with a symptom (acne) that something is not right. And this is the foundation of holistic nutrition -- address the root cause to clear up the symptom. I've seen a huge rise in my own clinical practice of clients suffering from acne over the last five years. The good news is that you don't have to suffer and there are in fact many natural solutions that do not have the negative health implications that antibiotics and Accutane have. I've put together this video for you on my top natural health and nutrition tips to combating acne. Please feel free to post your questions in the comments section below or on my YouTube channel. Hungry for more natural health info on problem skin? Check out this recent podcast with the Red Tent Sisters: Unexpected Solutions to Problem Skin. I can understand that acne can be extremely hard on your self-esteem and very stressful. My hope is that these solutions definitely help you achieve the beautiful glowing skin you deserve. If you really want to take control of your health once and for all then I highly recommend the Joyous 10-Day Detox. 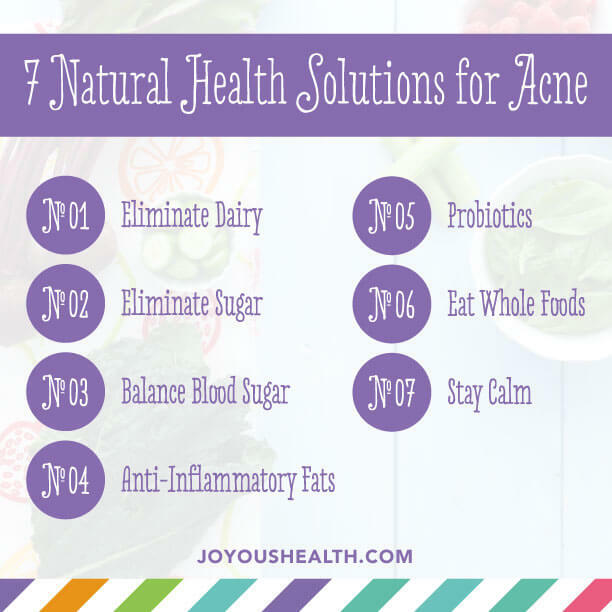 I've had thousands of people do this program over the years with incredible success clearing up their skin by eliminating the problem foods that promote inflammation and hormonal imbalance -- the root cause of acne. Check out a case study on my client Cindy and her acne problems. A success story: my client Kim and her struggles with acne and how she achieved glowing skin once she got off the pill and changed her diet. I wish you joyous health, which includes GLOWING SKIN! Amazing blog! Do you have any tips and hints for aspiring writers? I'm planning to start my own website soon but I'm a little lost on everything. Would you suggest starting with a free platform like Wordpress or go for a paid option? There are so many choices out there that I'm totally confused .. Any tips? Thanks a lot! This is the perfect website for anybody who would like to understand this topic. You understand a whole lot its almost hard to argue with you (not that I personally will need to…HaHa). You certainly put a fresh spin on a topic that's been discussed for many years. Excellent stuff, just great! What a great read and video. very informative. Howdy! This blog post couldn't be written much better! Going through this article reminds me of my previous roommate! He always kept preaching about this. I will forward this post to him. Pretty sure he's going to have a very good read. Thanks for sharing! An outstanding share! I have just forwarded this onto a co-worker who has been conducting a little research on this. And he in fact bought me dinner due to the fact that I stumbled upon it for him... lol. So let me reword this.... Thank YOU for the meal!! But yeah, thanks for spending some time to talk about this topic here on your blog. Wonderful blog! Do you have any helpful hints for aspiring writers? I'm hoping to start my own blog soon but I'm a little lost on everything. Would you propose starting with a free platform like Wordpress or go for a paid option? There are so many choices out there that I'm completely overwhelmed .. Any tips? Thanks! I can attest to your information above that diet is the foundation of health - with great impact on skin health. Nearly all my skin issues have been resolved by going through a detox with juices/smoothies and raw food. I really can encourage everyone with these issues to look into this - as I have been told for such a long time that diet makes no impact on skin!!! I wish I followed my own intuition earlier - it would have saved my skin and a lot of health issues I still have to clean up now. I have one question - from what I learned one should not combine carbs with proteins as they need differnt digestive juices and can turn the stomach into a sitation where no digestion takes place. You mentioned to eat protein with every meal - how do you ensure that the stomach still digest and does not turn into a feeling as if you have a brick in the tummy? Any information how you ensure good digestion - it does make sense to me to use protein to ensure blood sugar stays stable - but every time I try to introduce this it stops metabolism. Any hints would be greatly appreciated. Hi.. cheers from Jakarta! :) Your blog really helps me! Anyway I know that I should minimize bread as much as possible..but I'm thinking if it's ok to still eat bread that labeled as "suitable for diabetic"? Thanks! Wheat flour does increase insulin, even the healthiest of breads. When you see "suitable for diabetic" that's usually just "marketing" to get you to buy it. It's best to avoid breads if you are diabetic or eat them in moderation. Ok, I don't know where to start. I have absolutely horrible skin. I feel like giving up. I had acne as a teen. But now, at 31, my face is much worse. A "holistic" dermatologist just called it severe inflammation. I think it's some form of rosacea. My skin is a constant red, broken out, but also flaky and dry. Very different than the oily skin and breakouts I had as a teen. Sometimes it's hot and burning and/or itchy. I've also had some eye issues that I think could be attributed to ocular rosacea. Do you have any tips for rosacea in addition to these acne tips?? I wish I knew the root cause. I've considered the GAPS diet, which is a gut healing diet. But as much as I want clear skin, being on a restrictive diet is so hard when you eat with other people all the time. So my other question is: how do you stick with eating well when you eat in other people's homes a lot? Thanks for any help. Hi! :) Thanks for your blog.. it helpsss me a lot! I'm wondering for the probiotics.. 1. If yoghurt..in my place it's quite hard to find non dairy yoghurt.. dairy is not recommended right? 2. For kimchi.. i can only find two brands.. one is imported and one is local brand.. I prefer the imported one.. but do u think they might use lots of preservative msg sugar etc? Since it may takes quite long time for the distribution time.. Thankss anyway! Hi Joy, I followed your recommendation.. and yes it works.. :) now I'm focusing to clear up post acne marks.. not scars.. just some red-ish spots on my cheeks.. can you recommend best food to eat? cannot really find info that really focus on the marks and not the acne :) Superthanks for your help! Hi guys, I stopped taking birth control at the end of last summer, and since then my skin has gotten worse and worse. I have always had eczema on and off but apart from the bit of teenage acne a once had, I've never has such horrendous acne. My sister and I both broke out with cystic and hormonal acne at this stage in our lives. She is pregnant now and her skin is beautiful! I have spent the last 3 years cleaning up my diet and supplementing as needed, and so suddenly having this awful experience I feel very discouraged. I have even been addressing my liver, as excess estrogens seem to be an issue for many. I have been thinking of trying red light therapy as well. I want to keep trying, but it's so exhausting and I have spent so much money! Any advice?